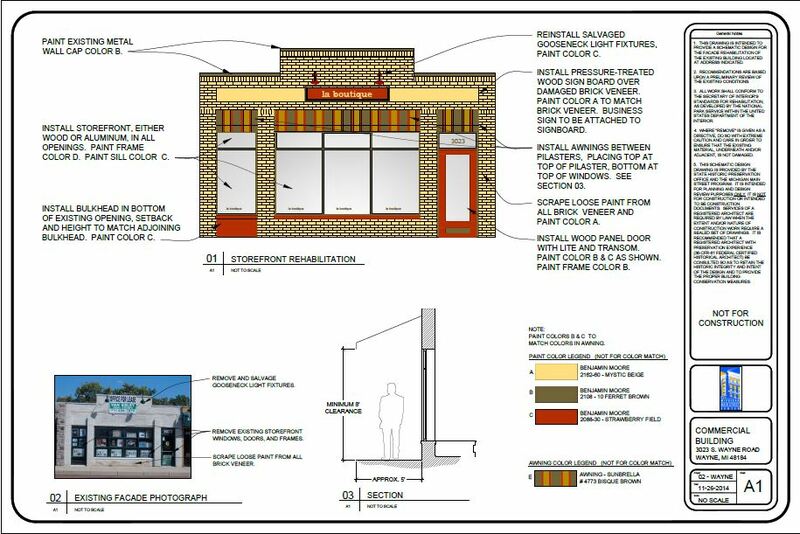 WAYNE, MI- Wayne Main Street’s board of directors approved property owner Paul Visingardi’s application for Wayne Main Street’s Façade Grant program. The Façade Grant program was developed by the Design Committee to help improve the appearance of buildings in Wayne Main Street’s downtown district. Visingardi, building owner of 3023 South Wayne Rd., was approved for $9,957.50. He will receive the reimbursement check after construction is completed. Planned Home Improvement of Westland, Mich. has been hired to complete the construction. Wayne Main Street previously awarded Visingardi complimentary Design Services, which will be implemented in the construction process. Design services provide business owners recommendations on how to improve the façade of their building to increase curb appeal while adhering to the Secretary of Interior’s Standards for Rehabilitation of historic buildings. Visingardi is hoping that the new improvements will attract potential tenants to the currently vacant building. The improved façade of Visingardi’s building will be a great change for downtown Wayne. The improvements will be made with respect to preserving the historic elements of the building. Individuals interested in learning more about the Façade Grant should visit the website, http://www.downtownwayne.org/business/grant, where the application and more information can be found. Applications are accepted on a rolling basis.